Below are our past Exposed cats, who you will find on many of our pedigrees. We have made the difficult choice of rehoming retired cats. This is always hard as we grow to love them but it is best for them to go to a home where they are loved and get the individual attention they deserve. Occasionally we have retireds cats up for adoption, keep an eye on our facebook page for more information and available. Chateau Bare Taco Supreme of Exposed. "Taco" is originally from the USA and originally CFA registered, he took a round about route getting here but I am very pleased to finally have him at Exposed. He is a Red and White male who we hope will produce many healthy babies. Taco was retired from breeding in 2017. Malachi was an odd eye white and was a totally hairless boy born here at Exposed. His Mother, Belle, is a daughter of our foundation pair Blue and Chip and his dad Neo was one of our most sucessfull studs. Malachi added his loving temprement and type to our Sphynx lines. Malachi sadly broke his tail running under someones foot as a kitten so could not make it to the show bench. He was totally unaware of any issues and was unbelievably loving. Fumble arrived early February 2009 from Suzette at Vande Bald's in Kimberly, South Africa. He was a very strong boy who we were very excited about. Fumble has a fantastic temprament and I love his look and type. Fumble gave us many stunning babies and can be found in many of our lines.s!!! Fumble moved to the USA to work as a stud for a short while before being retired into a loving pet home. Joe was a tough strong boy who is an F3 from our Sphynx hybrid mom, Roxy. Joe has a typical Sphynx personality always wanting a love and cuddle. 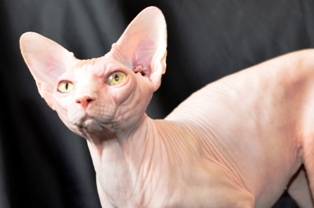 He helped us to build up the Sphynx gene pool which improved the health and type in the Sphynx. Joe developed a nice profile break which he passed on to future generations. Neo arrived late in 2004 from Scotland. He was a big strong strapping lad with a very gentle nature and a purr like a tractor. We are grateful to Carol for letting us have this stunning boy. Neo was one of our best studs and carriesd the odd eye gene. This means that occasionally one of his babies were born with two different coloured eyes - which we call an odd eye. Neo did very well on show - he won Best Adult On Show (9 July 2005) and he qualified for the SACC National Cat of the Year for 2006 & 2007 which was a great Honour. 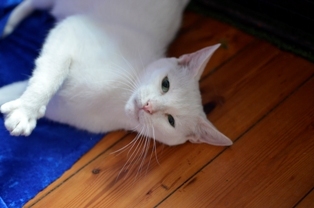 Neo's son Malachi took taken over from his dad and Neo left us for a home in New Zealand. Our first ever Stud, Chip arrived in Cape Town in September 2003 from Miami Florida USA. 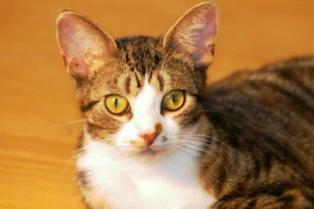 Chip was affectionate and very playful and loved Theresa to bits, she misses him very much. Chip did exceptionally well on the Show Bench and was our first national qualifier and placed 10th in the National SACC Cat Of The Year 2005. "Spot" is a very special Girl from Johan and Ian at Taldi in Port Elizabeth. 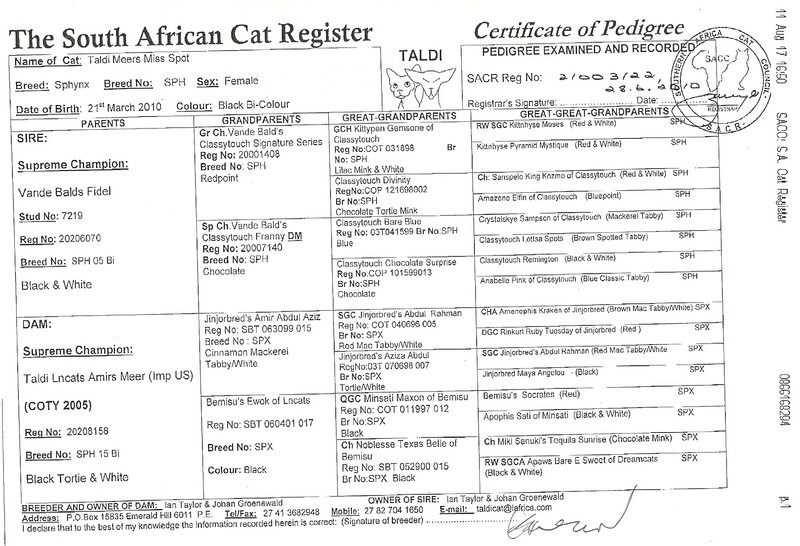 Her mom was Taldi's Lin Meer who was the The National Winner and Cat of the Year (SACC). She is a beautiful girl with great personality. Her babies have been strong and have had excellent type. Several of her offspring have won Best in Show and Cat of the day Awards at WCF shows. Spot is going to be retired very soon, just waiting for one girl from her and Max. "Layla" was bred here at Exposed from Dexter and Spot. She is a very effectionate girl with lots of potential. She managed to win Cat of the Day in her first show at the Darling Spring Show in 2015. She is staying here at Exposed to be part of the future as we rebuild our lines. Layla has many of our old lines wrapped in her Pedigree. Her Pedigree is also full of special tiltles including National winners as well as Regional winners. Very Sadly while pregnant with her first litter Layla got out our bedroom window one evening and came back with some bad scraches, at the time we suspected they where from a thorntree outside the widow. One of those kittens tested positive for FIV at 4 months old and we tested her and discovered she too tested FIV positive. So we started a systematic testing of all our cats and Layla was retired to a special needs home. Layla was the only cat to test positive. "Elisah" is from our original foundaion lines that have been returned to us. Her grandmother, Belle, is a daughter of our foundation pair Blue and Chip and her Grandfather Neo was one of our most sucessfull studs. "Toffee" was born with a very unique coat and her lines go back to a spontanious mutation that brought about a naked cat born in Kimberly. Her father was Dexter but her Grandfather was Exposed Malachi who we now strongly suspect could be the real carrier of this coat variation and totally unrelated to the Kimberly cat mutation. Only time and a few more test matings will confirm amd we hare enjoying the genetic mapping and puzzle solving to try find the origins of these genes. 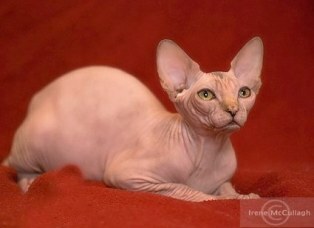 She is super loving and when put to a Sphynx should also give us a combination of coated and naked babies. "Halo" is very camera shy, well more like that she is more interested in climbing into the lens then being photographed....She is a First generation outcross (F1) who carries the gene for odd eyes (one green eye and one Blue eye). 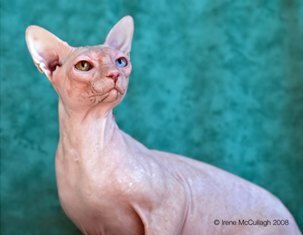 Her father is a Sphynx, when bred to a Sphynx male her babies will have a 50% chance of being hairless or 50% chance of being coated, depending which Gene they inherit. She is also a very special colour so we look forward to seeing what she produces as she adds type, health and vitality to our lines. Halo will be retired from breeding in 2017. Tango is a stunning girl from Magnolia and Joe. Tango was the overall winner at our Regional Finals - Cape Top Cat 2009 which was a huge achievement of which we are very proud and entitles her the Suffix RW (Regional Winner!). 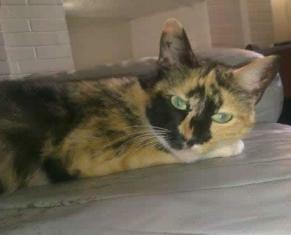 She has a very interesting colour like her mom and is a tortie pointed cat with aqua eyes (Mink). Tango was also Best Kitten on Show (SACC) at her first show!! Tango qualified National SACC Cat of the Year in 2008 (COTY) in the Kitten Section, as well as Cape Top Cat in 2008 & 2009. 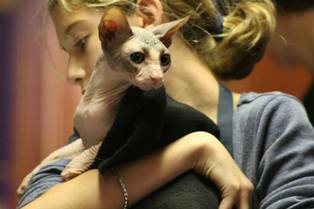 Tango now lives at Mugglesborn Sphynx in PE. 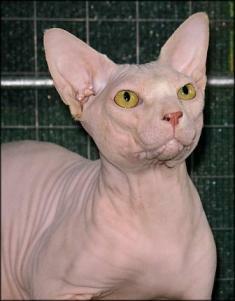 Razzmatazz was special to us as she is a 2nd generation Sphynx bred here at Exposed with both sides of her pedigree. Her mom is Belle who was born in our second litter and her dad is Joe and Grandfathers are Neo & Chip. On her first 2 shows in March 2008, Razzmatazz was selected as Supreme Cat of the Day (WCF) and the next show she was Best Cat on Show (SACC) !!! We are very proud of her. 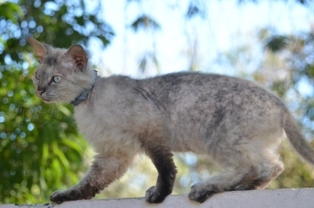 She qualified to represent the region at our National SACC Cat of the Year (COTY) in 2008, in the Kitten Section where she placed 2nd, and 2009 where she was the 16th placed Adult. 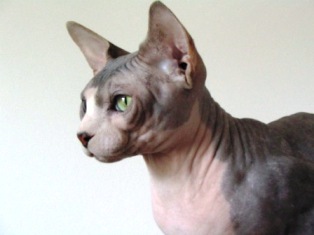 Razz was the highest placed Sphynx at COTY in both 2008 & 2009 being awarded Best of Breed both times. 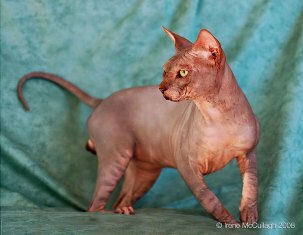 Razz also qualified for our Regional final CTC (Cape Top Cat) in 2009 and Placed second after Tango giving Sphynx the 1st & 2nd Places!!! She was also 2nd placed kitten in 2008. Luna Arrived from Scotland with Neo. She took the word "affectionate" to a whole new level! 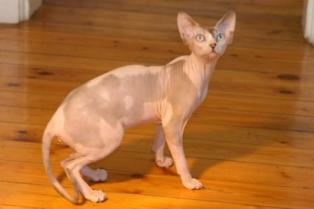 Luna is a cream Mink Sphynx, Mink means her eye colour is actually an aqua colour somewhere between green and blue. Mink also means she carries points (where a cat has darker colour on their nose,ears and paws). 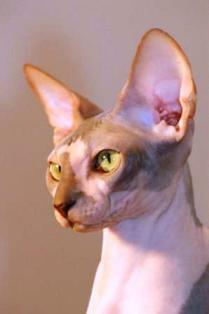 Luna was the highest placed adult Sphynx, at the SACC National Cat of the Year for 2006. And again made our national Cat of the Year in 2007. 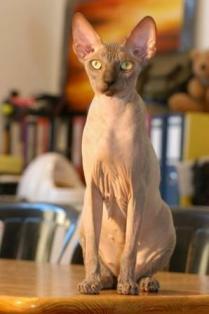 Zette arrived during the Soccer world Cup in 2010 from Disal Sphynx - A big thank you to Elizabeth Swart. Zette was a special girl who was potentially carrying a local naked mutation. 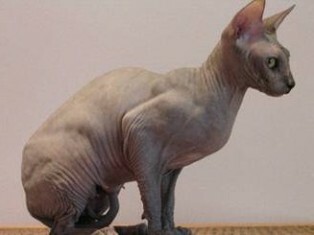 Zette's mom had a naked baby without being mated to a Sphynx. Zette as a Domestic with Domestic parents has had a naked baby boy in her first litter F1 with a Sphynx sire at Disal, which means she is carrying a naked gene. 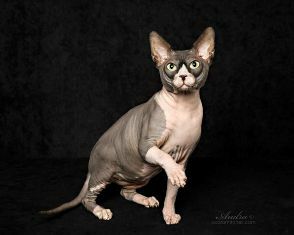 We used her to do some test matings here at Exposed Sphynx and are still in the process of understanding her genetics. Roxy arrived on the same flight as Mag’s in September 2005 from Wizardgate - Ed & James in North Carolina (USA). Roxy is a F2 Sphynx outcross/hybrid ASH which means her dad & grandfather were Sphynx. 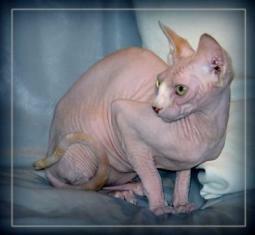 Her dynamic personality has crept into everyone's heart - a true Sphynx despite the furry coat! 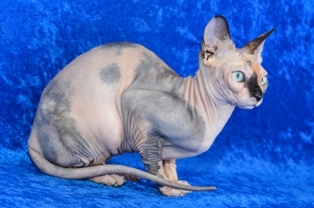 Roxy, being a hybrid brough a strong new bloodline into the Sphynx gene pool and this is essential if we are to continue breeding strong and healthy Sphynx. Roxy gave birth to Joe who was one of the best studs we had. Joe sired some of the best kittens type and healthy wise ever born here at Exposed, such as Razzmatazz and Tango. Belle was from our second litter born to Chip and Blue. She is super naked and very friendly. She likes to try jump into your arms from the floor - if given but half a chance. She is one of our more “elegant” girls. She too is an Exposed bred Supreme Champion and we hated to see her go to her new pet home where she is being well loved and adored. Amethyst was from our first litter born to Chip and Blue. 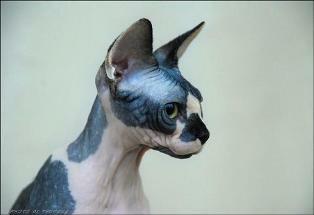 She did very well on show as a kitten in 2004, winning the Best Sphynx Kitten Trophy at the ABCC Trophy Show. In April 2005 she became a Supreme Champion, making her the first Supreme Champion we bred. 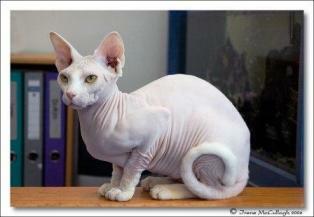 What makes it extra special for us was she was from our 1st litter here at Exposed Sphynx, we are very proud of her. She has also given birth to some super babies who did very well on the show bench. Amethyst was retired from breeding in early 2008 and moved to a loving pet home. Eclipse was special to us as she is one of our first 2nd generation Sphynx bred here at Exposed. Her mom is Amethyst who was born in our first litter and her dad was Neo. Eclipse had great mix, receiving some strong features from both her mom and her dad. On top of that she has such a great personality! Eclipse was retired from breeding in early 2008 and left for a loving pet home to live with Chip (retired Stud). Blue arrived in Cape Town in September 2003 from Miami Florida USA and was our foundation female and the true matriarch amongst the girls. She was totally hairless and extremely affectionate. Her favourite place to sit was on your shoulder. She loved attention and never took "No!" for an answer. Blue received a Distinguished Merit title in 2005 for the show successes of her kittens. Sadly Blue passed away here on 16 November 2006.